LauraN has a story to tell on her neighbor; don’t miss it. And I bet I can guess who the benchpressing instigator was. And now I’m going to tell you a story on my neighbor. First, though, a memory.Â Our last Halloween in New Hampshire, our toddlers were terrified every time I opened the door: no explanation of the concept of costumes made the slightest difference, and they could not understand how their own mother could continue to expose them to those, those, *things* out there. Just a few years after that, there was a Halloween where our children all had the flu and, after all their anticipation of dressing up and playacting and getting candy, had to stay home. We had a neighbor we didn’t see much, not a terribly outgoing sort, whose own kids were newly grown and gone.Â We didn’t know she had planned a special surprise just for our kids. But they never came to ring her bell.Â Huh. Well, this wouldn’t do. And so she finally rang ours instead: she had gone out and bought little decorated cardboard houses filled with the good stuff, one for each of our little ones, Halloweeny and celebratory to the max. She had no idea they were sick. She had no idea how bummed they were that they had to be on that day of all days.Â She had never thought to buy such a thing before, and come to think of it, she only did it that one year. But our quiet neighbor, making an impulsive decision when she saw something cute in the store, decided it would be fun to be generous, and by so doing totally made their day when they most needed it. And none of us old enough then to remember has ever forgotten that. Halloween always makes me think of her and those little boxes. I made it to the post office yesterday, and on my way there there were turkey vultures circling–at first glance, it seemed they were above the new assisted-living center in town. I thought, c’mon, birds, that’s tacky. But I had maligned them.Â They were, rather, staking out the garden center two blocks closer in.Â Ah, I see: vegetarian turkey vultures! Spotting a would-be gardener with a brown thumb arriving at the hopefully-named Summerwinds–definitely the territory of fly-in-the-sky plans–and waiting to zero in on the kill. What’s on the menu, friends? Tulipanfried bulbs? Apples, crisped by the drought? Or maybe peaches; they would make a cool whip. Okay, almond my own business now. Last time I saw the surgeon he got to play Santa. But I missed one nurse from that day: she saw me into the examining room, and we spoke long enough for me to feel she was one who truly cared about her patients too. She just sparkled. I was impressed, and sorry later to have missed her.Â I was expecting her to come back in but someone else did instead, the young nurse I surprised with a lace scarf at the end. Today was my last (oh honey I so hope) post-op at Stanford.Â A medical assistant told me they were crazy-busy today, that they had 45 patients to get through. Wow. But when Dr. S. came in, one of the first things he said was how much his wife loved her shawl. The man is a peach. (And so is his wife! )Â He was completely focused on me and on taking care of me and on answering my questions; nothing else intruded. I’d been scoped yesterday?Â (Thank you Dr. R.! )Â We discussed where the bleeding had been and for how long–it finally stopped today; he told me why it was normal there with a blockage, and I came away very reassured. But he also told me to call him next time there’s any such problem, and he clearly meant it. Having done two blockages now, I needed to hear that. Thank you, Dr. S.
Before I left home, I’d put some of the cuter Peruvian fingerpuppets in my purse, and as he was on his way out the door, I gave him a few for future pediatric patients or for children of patients.Â He looked at the fish and laughed. I saw that missing nurse briefly again in the hallway as I was coming out.Â She was talking to another patient, and there was a scale right there with a chair next to it; I commandeered the chair while fishing quickly through my knitting bag for the scarf that had been waiting a month for her.Â But by the time I got it out of the ziploc, she was walking briskly away. I called her name after her. That startled her–Who? as she spun around.Â How did you…? I finally got to tell one more person who deserved it how much her kindness and smile meant each and every day to all the people streaming through those doors. Forty-five people is a lot of eased burdens just today. She was so thrilled. She so much deserved it. She made me so happy.Â This is why I do this. I didn’t think I was susceptible. I read Afton’s KnitTalk posts describing herself as a cheerleader, pompons pumping, pushing knitters to finish old projects by Halloween. Don’t think so.Â Pay no attention to the woman behind the curtain. You know the type: talks everybody else into doing the work while she teases her cat with *her* yarn. And then Monday night I got to idly wondering if, y’know, maybe I could finish those Casbah socks before Thursday morning–that pair I started a month ago.Â I would have to do nearly half the foot and the toe on #1 and do #2, start to finish. And graft! Half the stitch count of a quick shawl while having to use (oh joy) size 0 needles. Yeah right. There’s a reason that pair’s colorway was called Glacier. Hey, Chris, Vachel hasn’t been knitting lately; should I sic Afton on him? He’s in an octopus costume this week, can he knit four times as fast? When someone lists a gallon of milk for sale on Amazon–wait, it gets worse, the price is $69.99–it begs for reviews like this one. Or the person who says get the Kindle version, it’s only ten bucks.Â And then, looking under “new and used” there is of course the overpriced collector’s edition going for $2,500.00 plus $4.49 shipping. Gee, cow can we resist?Â After all, feeding our families well is a heifer responsibility.Â I wonder if they’ll bring a DVD too so we can watch a moovie while they whip up that tiramisu. And how about a salad on the side with a little ranch dressing.Â You hoof to hand it to them, that’s a pretty strong incentive: real food, real local.Â It’s a grass-roots moovement! I’m in good hands. I talked to my Dr. R today; I’m to call him again tomorrow. He’s keeping close tabs, and things have been improving somewhat. Meantime, a photo from last year’s trip East: this is the first time in three years we haven’t made it back to Maryland in the fall, so I dug out some pictures for a little visual Canal hiking.Â (Hey, Karen!) I spent a fair amount of time tweaking pattern ideas and debating yarns today, then I walked away to do brainless housework in order to give my subconscious some time to sift through things. Back to work.Â Who knew that cleaning lint filters and folding towels were good for designing C&O Canal towpath patterns in lace? Thank you, everybody, for your good wishes, kind words, prayers and support.Â In the self-diagnosis department, it looks clearly now like a blockage, and I heard from one person with far more experience than I at this colectomy stuff that it’s normal for that to have some bleeding with it. That is SO much better news than a new Crohn’s site. It’s temporary and it’s fixable. We’ll see what the doctors say. I have my last post-op appointment with my surgeon next Thursday. Just yesterday I was telling an old friend, as I have a number of people now, that, yeah, I’d had a rough year but it was all over and I’m fine now and it’s a wonderful place to be,Â free of all that and with more energy than in ages. And I got that call from MedicAlert last week, getting things updated; eh, you never know, right? That you might wake up the morning after their bracelet comes with everything back and staring you right there in the face.Â Blood.Â The Crohn’s. That bit of achiness at night? It wasn’t post-op normalness after all, and today, food isn’t happy staying down. My surgeon and I will have more topics to discuss than I had had any plan to. I’ve sent a note to my Dr. R, meantime.Â Next week will be interesting. (Edited to add: my husband just came home from Costco with a huge package of Seckel pears! I’ve been looking for those fruitlessly, fruitlessly, I tell you.Â They are THE best pear on the planet, their season is short, they can’t grow here because they need too much cold to set fruit so I can’t grow my own–if you find some, buy them! She was so thorough. She went over everything.Â *Everything. *Â For an hour.Â She thought of things to ask that I didn’t think to mention.Â When she was unsure of something, she went to go ask the woman she described as her mentor, and she was passionate about her work and about taking care of people in emergencies.Â This wasn’t just a job, this was important to her.Â I was really, really impressed. It was time for renewing my MedicAlert membership and I hadn’t gotten around to it:Â I never wear the necklace, the engravings on it are way out of date, I’m doing well and not worrying about it anymore, and, eh, I’d let it slide. So they called to ask if I wanted to renew? A few things have happened in the last year, actually, yes…Â My stars, they even had a code for “allergic to Hollister brand stoma paste” to check off. Mindful of my dislike of the too-long chain and the too-big emblem on that necklace, I asked for not only a bracelet to replace it, but a really small one. Sure, no problem.Â Measure your wrist, we’ll add so much for the closure. I want a little extra give to it. Oh, no, that half inch closure is plenty. I want a little extra to mine. Oh, no, really, this is the way you want to go. (This is my personal endorsement of MedicAlert. It’s a good idea and a good organization. If you need it, do it.Â But don’t get the necklace if you won’t wear it because you like wearing your own necklaces like I do. I’d stayed away from the bracelet because I was afraid it might fall into my knitting and snag it. I looked around at Knit Night and noticed, for the first time, the wrists with MedicAlert bracelets on them–three, I think it was. I guess it must work out after all? Knitpicks.com is having a 40% off sale on books in stock. I recently learned that “Wrapped in Comfort,” after the publisher had a bad quarter, is about to go out of stock permanently.Â I note that Amazon has now raised their price. I’ve been putting off mentioning it because I bought some cases but don’t yet know the details of what is required of me re selling copies myself, nor am I sure where to go to find out–but I can say that if you buy a copy from me, it’ll be signed. My huge thanks to my readers for a good run with it.Â Onward! The first picture, taken this morning through double-paned windows, is for Lene , who has a much better camera. We’re all space aliens here.Â Pass the black holes on that flying saucer for me, willya? So do I end it with something difficult for a new knitter to pull off? (It would always be only-optional anyway. )Â You know–something edgy? For those who wanted to know what I was listening to Thursday night, thanks to KDFC’s website, I found it; it’s Jonathan Biss (I read it as “Bliss” the first time, too funny) and his album is here. I got a surprise package today from Cathy, who’s been ill herself, but here she was, thinking of me instead. And from Anniebee. And Margaret. Julie. Stephanie. Kimberly. Ruth. Wishing me well on recovering from my last surgery, with cards, hot cocoa, dark chocolate (Cathy), handmade stitch markers (Ruth), the best use of a stray bit of dyed wool I’ve ever seen on Margaret’s card, and a handbeaded coin purse, sachets, a Canadian maplewood bookmarker, and a handknit pearled (spelled that right) flower pin from Anniebee.Â My goodness. Thank you! To that I guess I owe a how-I’m-doing, which is very well overall. I did lift a 25 lb bag of birdseed Saturday and realized that I might want to wait just a little longer on that; I was testing my scars to see if I’m up to using my heavy dyepot yet.Â It’s been a year since I made dye out of my fading amaryllis flowers, and I am antsy.Â The answer would be, honestly, not quite yet. But close! And in the random findings department.Â Sometimes some things (this is their photo) just grab your attention. 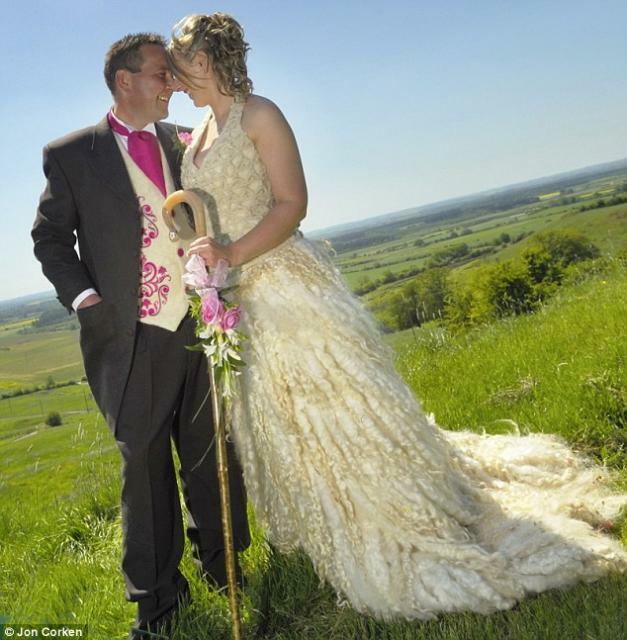 Like a hand (partly) -spunÂ handmade wool wedding dress and groom’s vest from the bride’s Lincoln Longwool sheep. Note that this is not a soft-haired breed; this is the sturdy stuff they make carpeting out of.Â Honey, just don’t let him walk all over you.Â I do love the effect of alternating solid locks with fluffy, whiter slightly-pulled-apart ones, and clearly it’s all been solidified and felted a bit by washing, but I gotta tell you–she got fleeced. Little Bo Peep, did she lose any sleep over whether she’d be dragging her veil behind her? But once you get pasture initial reaction, hey, clearly, they’re having a good time: already raising a little cane there, and everything’s rosey. Add a little Biss-ful Beethoven, and there ewe go. An experiment in Sweden to see if making the stairs fun would cause people to choose them over the escalator in the subway station. Go see the stairs that were turned into a piano.Â Great fun! I met up with Gigi of the Knitmore Girls and some of the Minions of the Pointy Sticks at Le Boulanger down thataway today. Four years, maybe five, you’d think I’d have taken a picture of it by now.Â Sorry for another no show here. Anyway, the story, and I think I’ve told some of it before, is: I was going to Stitches West one time, and it was the first time I was trying to manage my electric chair by myself which I need for long days out. Open side door of minivan, pull out unattached ramp, unfold ramp, set it up in doorway, done. Except the “This side up” sticker happened to have been glued on the wrong side. My husband had never noticed; he just intuitively got the mechanics of the thing, like I would have if it had been something reasonable, like, say, a knitting pattern. Which is why when I started backing that 250 pound chair down the ramp the hinge was on the wrong side and the whole thing collapsed on my foot. Annnnndddd, the newly-charged battery hadn’t held the charge.Â It was nearly dead. Just enough juice to get it back up in there with the desperately-needed help of some random passersby. It was not starting out well here.Â I IM’d my husband and he offered immediately to leave work, rescue me, and get me in for x-rays. I made it to my friend Karen’s booth, holding myself together right up till that point, but the moment Karen and Gigi looked at my face and asked, wonderingly, “Are you all right?” I lost it and bawled in pain and frustration and worry. Gigi’s daughter Jasmin (and Gigi and Karen, for that matter) offered to drop everything and drive me to the doctor; when I said I just couldn’t go yet, not when I’d just gotten here, and besides, they needed to man their booth, Gigi’s then-teenage son Sam came to my rescue. He went out, found someone in charge somewhere there at the Santa Clara Convention Center, came back with a manual wheelchair which by now I really really needed, and proceeded to push me around for the next two hours.Â He was very patient with my being interested in random people or yarns going by–oh, look at *that*!Â Ooh, that’s pretty! Hey, Alicia!Â BARBARA! How ya *doin’*!Â Â Stitches West is a grand reunion as well as a knitter’s Disneyland.Â Sam was the soul of gentleness and totally put up with the craziness that is me at those conferences, all while being very mindful of where my foot was going. He got me to Lisa Souza‘s booth, where I bought some sock merino in her Seafoam colorway and showed it off to Gigi before calling it a day, and Gigi exclaimed over it, telling me she’d bought the same colorway from Lisa too. Two weeks later, when I’d recovered enough to make the drive, I took Sam one of my chocolate tortes and thanked him for being my hero when I’d so much needed him. Such a nice kid!Â I wanted him to know how much his cheerful readiness to help and his patience had meant to me. Gigi is having heart surgery next week. What she never knew, was, I knitted up that Seafoam all that time ago and set it aside for the right moment: whether it was for her to wear to brag on her son or for Sam’s future bride someday way off in the future, I did not know. But it could not possibly go to any other family. That skein of yarn had too many important memories from those moments to mean as much to anyone else. It was for them. I told Gigi all that today as I handed it to her for her to wear now. Heal well, friend. As your family helped me to, too, on many an occasion by now.